Now is an opportune time to review the cut-glass patterns produced by the O. F. Egginton Company early in the twentieth century. A considerable amount of material is available, some of it quite new. This material can assist us in correcting the written record of the Egginton company, where necessary, as well as producing a comprehensive and accurate check list of the company’s cut-glass patterns. P. S. Send for Illustrations and Prices. Special $100 Assortment. We have received from the O. F. Egginton Co., Corning, NY, illustrative sheets of their cut glass, and it is a pity every dealer in the trade has not samples of these sheets before him, as they demonstrate very clearly the excellent character of the Egginton cut glass work. . . . This catalogue was issued apparently for salesmen of the O. F. Egginton Company. It came into our possession without the original cover and with a loose leaf screw type binder so that pages could be added and deleted as the salesman might desire. Thus, new designs could be included or discontinued designs eliminated.The cover has been designed by me in the manner suggested by an advertisement of the Egginton Company that appeared in GLASS AND POTTERY WORLD, June 1906. The small number in the lower, left-hand corner of the page indicates [the]original [chronological] sequence. I have rearranged them in so far as practical so that the different classifications such as bowls, vases, etc. would appear in the same section. I have also made up subject and pattern indexes for quickly locating the various types of items and the particular patterns you may be seeking to identify. It is evident from the foregoing that the Egginton company issued only “illustrative sheets”; no catalog, as such, was ever published by the company. Lucille Egginton, one of Walter E. Egginton’s daughters, worked for her father’s company for six years, beginning when she was only eight years old; this would have been in 1905. It was undoubtedly during her earliest years at the factory that Lucille became aware that the company’s cut glass was being photographed in Corning on a more or less routine basis. When she recounted this experience more than 65 years later, in 1972 (Kohut 2006), she believed that the photographs were taken for “yearly catalogs” when, in actual fact, their use seems to have been limited to an open-ended collection — such as the one acquired by Pearson — and “cuts” that were used in ads that were submitted to various trade journals. The company’s advertising campaign began in 1904 and was fairly active until early in 1907. The trade journals used included KEYSTONE, AMERICAN POTTERY GAZETTE, and CHINA, GLASS & POTTERY REVIEW. Some ads were quite large and must have been a considerable expense for the company. This probably explains why advertising became more restricted early in 1907 and then ceased entirely. The company had found it advisable to economize. Although advertising began again in 1916, it continued for only a brief time before the company was forced to close in 1918. The ads during this late period show glass cut and engraved in the realistic style that had become increasingly popular after c1910. Economy was emphasized. Patterns illustrated in the ads during this “last hurrah” include Alpha, Trilby, Orion, Orchid, and Melba. (Smith and Smith 2003, vol. 2). Interest in these patterns is usually limited to “completist” collectors of Egginton cut glass. It is suggested that the date of Pearson’s “catalogue,” circa 1910, be changed to c1904-c1906, based on the Egginton advertisements that are now available (Smith and Smith 2003, vol. 2) and taking into account newly discovered information about the company. Antique, Arabian, Arabian No. 2, Arion, Atlas, Berkshire, C, Cambria, Carnival, Castillion, Cluster, Corinthian, Creswick, Dryden, Filigree, Geneva, Genoa No. 2, Glenville, Gloria, Gothic, Grapes, Granada, Iroquois, Lemons, Lotus, Marquise, Marsailles, Miller’s Rock, Narcissus, Nelson, No. 2, No. 20, Odd, Orient, Orleans, Pillar, Prism, Prism-Special, Roman, Sherwood, Spartan No. 2, Special, Spider Web, Steuben, Strathmore, Straw[berry] Diamond, Tokio, Touraine, Vendix, Vendome, Victoria, Vienna, Virginia, and Yorke. Note that this list contains neither the Genoa (No. 1) nor the Spartan (No. 1) patterns, patterns that must have been produced at an early date, and that the Sherwood pattern was advertised, apparently only briefly, as Apple Blossom (in the Oct 1904 issue of KEYSTONE). 3. Additional Egginton pattern-names courtesy of Lucille Egginton. A number of additional patterns are listed in the discussions published by Spillman in 1979, 1997, and 1996. Spillman’s 1979 account carries the reference: “Most of the information in this chapter is taken from interviews with Susan Egginton Altonen and Lucille Egginton of Corning, July 1974, both daughters of Walter Egginton.” (Spillman 1979, p. 328). In the revised edition of this book (1997) this reference is repeated (Spillman 1997, p. 328) and no additional citations are provided although Spillman mentions that she interviewed Lucille Egginton in 1977 and 1978. There are no records or transcripts of these interviews, nor of the previously- mentioned interview of July 1974, in the collections of the Rakow Research Library. Spillman’s 1997 account credits Lucille Egginton with a list of patterns (apparently not illustrated) that is identical to a list that is found in the 1979 book but with one addition: the Arabian No. 2 pattern. It is worth noting that when this pattern, on a small bowl, is shown in the original account of 1979 where the pattern is misidentified by Lucille Egginton as Cluster, the name of a different pattern. Spillman, however, used the Cluster identification for this item in spite of the fact that it is positioned directly opposite an advertisement from 1906 that clearly shows that the pattern’s name is Arabian No. 2. Spillman corrects this error in her revised account of 1997. The bowl is now in the Museum’s permanent collection (acc. no. 86.4.19). Quotation marks are used in the following paragraphs to indicate pattern-names that have not yet been confirmed as official Egginton names because documentation, such as factory records and official advertisements, is lacking. Reason strongly indicates that several of these names are official ones, yet one is not yet 100% certain that they are; hence the quotation marks. These patterns include “Calvé,” “Trellis,” “Magnolia,” and “Kohinoor.” The latter is the name, proposed here, for what has been called “Trellis Variant” and “Triple-miter Trellis” in the past. All such names that include the word “trellis” are inappropriate because the principal motif is triple-miter cane, not trellis (also sometimes called lattice). Note that this pattern does not use what is known today as the Kohinoor motif. The “Kohinoor” pattern is discussed further later in this file. Although the Russian pattern is on Lucille’s list (in place of the Persian pattern listed above), the following explanation is in order: The Russian pattern was widely cut and, therefore, is likely to have been cut by Egginton, but it was more popular before 1900 than after this date. It could have been listed by Lucille Egginton, as Spillman indicates, but this writer believes that the so-called RARITIES book, which was published in 1975, comes into play here. He suggests that Spillman (or, possibly Lucille Egginton herself) consulted this publication and noted the plate on p. 169 that is signed with the acid-etched Egginton trademark and is said to be cut in the Russian pattern (Wiener and Lipkowitz 1975). In point of fact, however, the pattern is not Russian, but Persian. Such an error is typical of Spillman; she seems to have seldlom double-checked the pattern identifications found in her publications as well as those on labels at the Corning Museum of Glass, her employer. Spillman unfortunately frequently chooses to rely on what donors and others tell her without seeking confirmation elsewhere, an unfortunate situation. Tray cut in Calvé or Trellis variant pattern, O. F. Egginton & Company, about 1900-1910. D. 36 cm, trade-marked. Courtesy Tom and Marsha de Graffenreid. Crofford photo. This Spillman caption is ambiguous. Does it mean that “Calvé” and “Trellis variant” are identical, or does it mean that they are two different, but acceptable, names for the same pattern? In either case, this is error no. 1. It would also be incorrect to label the pattern as either “Calvé” or “Trellis variant” (errors 2 and 3) — according to evidence in this file. Lastly, as a bonus Spillman provides a fourth error: The official name of the Egginton company since its incorporation in 1899 is the O. F. Egginton Company not O. F. Egginton & Company. For some reason — probably a reflection Spillman’s influence — the company is also incorrectly listed as O. F. Egginton & Company in the Museum’s computerized data base. The [This] variation of the Trellis pattern by Egginton is called “Calvé,” named after the opera singer Emma Calvé. Contrary to what has been written elsewhere, and thanks to Lucille Egginton as mentioned above, we know exactly what Egginton’s “Calvé” pattern looks like. It is, in fact, nothing more than the widely-cut Cane pattern — the generic double-mitered version — where Egginton has elected to cut Brunswick stars on the pattern’s hobnails (hexagons). Other cutting shops, both in this country and abroad, have used other minor motifs on cane’s hobnails: for example, strawberry (fine) diamonds, single stars, and hobstars. 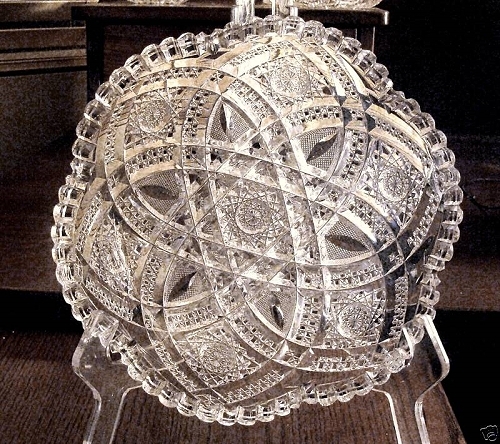 The main point is that Egginton chose to use Brunswick stars exclusively, as far as is known, on all examples of his “Calvé” pattern. Although it is rather poorly illustrated in the first two Spillman books, Wiener and Lipkowitz (1975, p. 208) provide an excellent photograph of the Calvé pattern on a signed cream and sugar set. (Unfortunately, the authors have labelled the pattern Trellis Variation!) Lucille Egginton seems to have always treated this pattern as “special”, perhaps believing that it was cut exclusively for her. The Wiener and Lipkowitz reference, however, proves that the pattern was also produced commerically. It is natural to move our discussion from “Calvé” to “Kohinoor,” the pattern that is, unfortunately, often called “Triple-miter Trellis,” “Trellis Variant” or something similar. The pattern is nothing more than Triple-miter Cane where Egginton has again chosen the option of cutting Brunswick stars on the pattern’s hobnails. We should permanently ban any use of the word “trellis” in connection with this pattern and use the name “Kohinoor” instead. Note that the motif that is called Kohinoor is completely different than the “Kohinoor” pattern. By the time the “Trellis” pattern was patented, the Egginton company undoubtedly had learned to economize. No longer was it advisable to produce “illustrated sheets” and large “cuts” for advertisements. It appears likely — but can not be proven at the present time — that Egginton turned to J. Hoare & Company for help in “getting the word out” for two new, and expensive, patterns: “Trellis” and a second pattern that we now call “Kohinoor” (even though Lucille Egginton did not include this name on her list). But read on. Both patterns appear in Hoare’s 1911 catalog. It is assumed that Egginton probably followed an advertising program pioneered by Hawkes and Dorflinger many years earlier. At that time, during the early 1890s, Hawkes was not producing a catalog — he probably considered it an unnecessary expense — but he undoubtedly felt some pressure to advertise his wares. Therefore, he entered an agreement with C. Dorflinger & Sons where that company would include a few Hawkes items in its catalogs. This arrangement appears to have been satisfactory for both companies. Egginton would likely have remembered this arrangement. It seems reasonable to hypthesize that he approached J. Hoare & Company with a similar arrangement in mind. Unforunately, no files containing correspondence between Egginton and Hoare are extant. Examples of the Kohinoor pattern are found today signed with the Egginton or the Hoare trademark or else unsigned. To date Trellis has been found either signed Egginton or else unsigned. The writer is not aware that the Trellis pattern has been found with a Hoare trademark, but, analogous to the Kohinoor situation, this is a possibility. Although “signed” cut glass is frequently over-evaluated, the situation regarding Egginton cut glass is somewhat different. This occurs when the only indication that an item is an Egginton product is the presence of the acid-etched Egginton trademark. Two such items are illustrated in Carlson 2006a: a ten inch bowl in a pattern that is similar to Hawkes’s Brazilian pattern (on p. 15) and a seven-inch plate in a pattern that is based on Hawkes’s Grecian pattern (on p. 16). The latter is also illustrated in Kohut 2006. Without the trademark, it is unlikely that either item would be identified as having been made by Egginton. One must also realize that some Egginton cut glass was undoubtedly accidentally not signed and will, therefore, probably never be identified as a product of this company. And, in addition, even with a trademark there will always be some items, like the bowl and plate mentioned here, whose pattern-names will probably remain unknown forever. Pearson, J. M., 1982: CATALOGUE OF THE O. F. EGGINTON COMPANY, CORNING, NEW YORK with title page, preface, and subject (article) and pattern indexes by J. M. Pearson. American Cut Glass Association. 75 pp. Reprinted by the ACGA in 1995. Additional Books: Carlson 2006a; Pearson 1975-8; Smith and Smith 2003; Spillman 1977 and Spillman 1997 are referred to as Farrar and Spillman 1997 and Sinclaire and Spillman 1997, respectively, in the Bibliography (Spillman wrote the Egginton chapters in these two books which she co-authored with Farrar/Sinclaire. ); and Wiener and Lipkowitz 1975. .
[Kohut, John], 2006: An interview with the Egginton sisters, The Hobstar, Vol. 28, No. 7, 4690 – 97 (Apr 2006). Spillman, J. S., 2005: The Egginton family: glassmakers on the move, The Glass Club Bulletin, No. 203, pp. 5-16 (winter 2005).